(You are) Worthy & Envelope, originally uploaded by Leah Virsik. It’s day 9 of Art Every Day Month with Leah Piken Kolidas. I just barely got the reference to this being about 30 days… as in it usually takes about that long to create a habit. 🙂 The love that I’m receiving from this group is super amazing and I’m really grateful for everyone who has commented on my posts and flickr images. Thank you! I added some stitching and handwriting to my mini painting above. I created the envelope from an Interoffice envelope. I didn’t know there were so many different varieties! My body is super sore from an intense yoga workout with Alice yesterday. I’ve been wanting to step up my yoga practice and it seems to correlate with my doing more art lately. There’s part of me that wonders where I’ll fit it all in and then another part that believes that they are connected and if I do more yoga I’ll do more art too. It’s so satisfying to push my body past the point where I actually feel like going. And it’s frustrating to be working out and feel so out of shape. I’m currently working on my quilt top. I’ll post photos eventually. Combining colors and pattern and lights and darks… and not painting over… This is where I’m having to stretch. I ran across this mosaic artist today who “paints” with glass. Looking forward to hear Alyson B. Stanfield speak about artist self-promotion this Saturday in San Francisco. She’s awesome! I highly recommend her book, I’d rather be in the studio. Nice work…I love how you wrote “you are” in front of worthy…very cool! Oh, I listen to Alyson’s podcasts…fantastic! The colours, the textures, everything. Very wonderful. The colors are so great. Love your work. 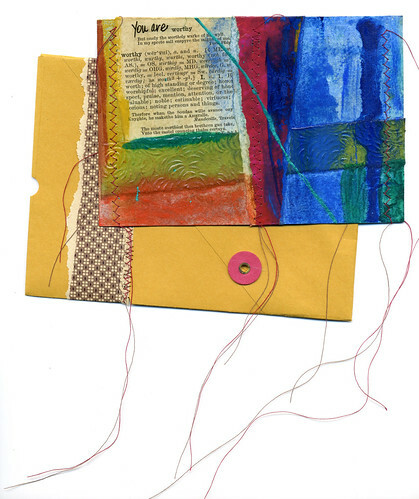 I love the way in which you have created your envelope. Worthy is wonderful! Very interesting and fun. I’m digging this piece. The stitching is a wonderful touch! The message and the colors are so rich and enthralling. Gorgeous colours and texture Leah, Im still trying to master the art of stitching papers….not had great results so far….so this has inspired me to have another go, well done. I do like your artwork, love the vibrant colors and possitive affirmations! Thank you all for your wonderful comments. I’m really touched. I will connect more personally soon.